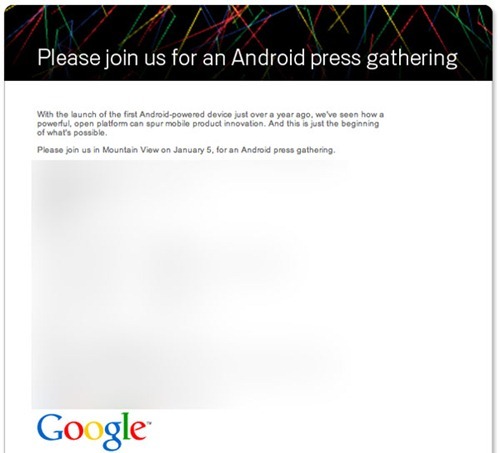 Google is set to announce its plans for the upcoming Google Nexus One phone in an Android press gathering to be held at its Headquarters in Mountain View, California. Engadget has grabbed a screenshot of what looks like an invitational card for the said event. This is what it reads. Nexus One surely is going to be the highlight of the event. For those of you don’t know, Nexus One is the name of the Google phone which has been designed by the folks at Google, and the hardware is manufactured in partnership with HTC. It will be powered by the latest version of Android OS and will be sold online by Google, fully unlocked so that you can use it with any carrier you like.